Our family embarked on our Schechter journey almost nine years ago. Barbara and I had three very important considerations in making our decision about our daughter Ashley’s primary school education. We were looking for a school with a focus on substantive Jewish content, a secular curriculum that would provide a framework for educational excellence and a nurturing, comfortable environment, with teachers who would support, encourage and shape her learning process. With each passing year, we are more convinced that Schechter was the right choice for our family. Both Barbara and I have become increasingly more involved in Schechter over the years – Barbara as a room parent, regular volunteer for pizza lunch and book fairs and this year as a costume designer for the Grade 8 play, while I took on a leadership role in the Annual Campaign and am now VP of Development on the Board of Trustees. Inspired by our family’s Schechter experience, we recently made a meaningful gift to the Generations Campaign as our way to express our appreciation for the education Ashley has received from Kindergarten through eighth grade and our desire to ensure the future strength and success of the school. In our final year as Schechter parents, we are eager to express our gratitude and appreciation with words of praise for the Schechter education Ashley has received and with strong financial support for both the Annual Campaign and the Generations Campaign. The Generations Campaign, when successfully completed, will double the size of Schechter’s endowment and provide financial stability and viability to Schechter for years to come. It will ensure that Schechter will continue to provide educational excellence for future generations of students and will provide tuition support as these costs continue to rise. Schechter enjoys a legacy of more than 55 years as a Jewish day school for the Greater Boston Jewish community; but the number of years is not the only important measure. Schechter’s graduates have gone on to be successful in a modern and complicated world and to possess and practice a Jewish value system in their daily lives. For Schechter to continue its legacy, we must all understand the importance and value of a Schechter education and the foundation that it creates for our children to become great Jewish citizens of the world. My hope is that every Schechter graduate will harken back to their early educational roots and support Schechter so the next generation of young American Jews can reap the same benefits. And I hope every Schechter parent and grandparent will reflect on what Schechter has meant to their children and grandchildren – visualize how much better prepared they will be for the future with the foundation during formative years of a Schechter education. There is no better way to demonstrate the value of this education than by supporting Jewish day schools. Today, as Jews, we must continue our leadership roles in the world. We cannot do so without a strong educational focus, the kind of focus that Schechter provides for our children who will be the future leaders of the American Jewish community. 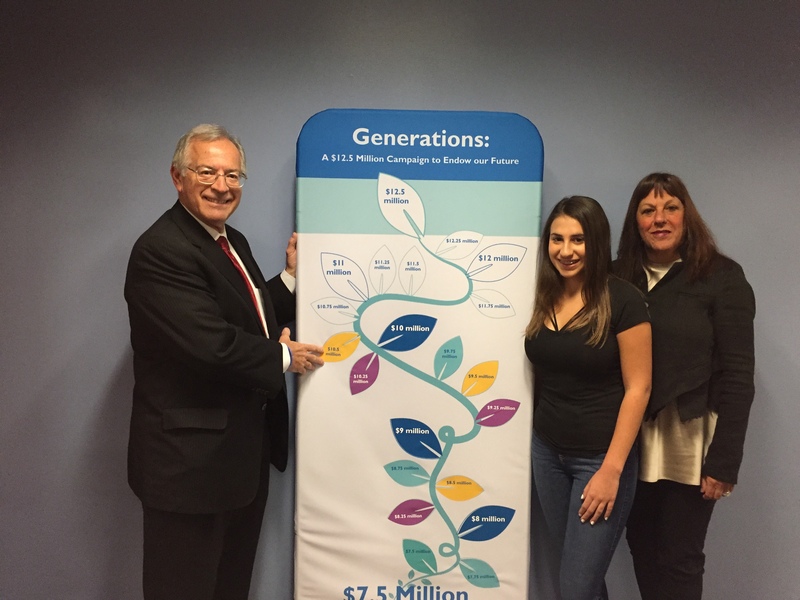 Pictured: Ellis, Ashley and Barbara Morris place a leaf on the Generations Vine signifying that the Campaign has crossed the $10.5 million milestone. As of March 2017, Schechter’s Generations Endowment Campaign has raised $10,775,273 toward our $12.5 million goal.